In Las Vegas the two fighters received the high-end luxury sport-utility vehicles valued at nearly $100,000. The new Range Rovers are a specialty Windsor Collection edition Land Rover that comes with custom STRUT body kits and full audio-video and navigation systems. Mark Coleman UFC 100 Interview As He Prepares For Stephan Bonnar From Raw Vegas. Bellator Fighting Championships Highlight video of Nick Pace Vs. Collin Tebo. The bout took place on June 12, 2009 at the Mohegan Sun Arena in Uncasville, Conn. Taped June 12, 2009 at Mohegan Sun Arena in Uncasville, CT. Highlights from the Nick Pace vs. Collin Tebo matchup. Nick Pace lands a devastating Muay Thai flying knee kick that floors Collin Tebo with power and authority. Former Collegiate / WWE Wrestling Champion Bobby Lashley faces Bob “The Beast” Sapp @ Ultimate Chaos from the Mississippi Coast Coliseum & Convention Center. Pedro “The Rock” Rizzo fights Gilbert “The Hurricane” Yvel @ Ultimate Chaos from the Mississippi Coast Coliseum & Convention Center. Affliction Vice President Tom Atencio faces Randy Hedderick @ Ultimate Chaos from the Mississippi Coast Coliseum & Convention Center. Frank Mir Talks To About His Upcoming Fight; A Rematch Against Brock Lesnar at UFC 100, on July 11th. On September 16, 2009, internet street fighter Kimbo Slice will join the new cast of Ultimate Fighter Heavyweights season 10. The coaches will be Quinton ”Rampage” Jackson & “Sugar” Rashad Evans. “Talking Monkeys in Space” features UFC Commentator and long-time comedian Joe Rogan in this SpikeTV comedy special. ESPN Radio grabbed Diego “Nightmare” Sanchez after his win over Clay Guida where he talks about his opponent’s toughness. We also added part of a prefight conversation where Sanchez hints that someone may need to fill in for B.J. Penn at UFC 101. Jason “Dynamite” Dent fights Cameron Dollar @ The Ultimate Fighter Season 9 Finale from the The Pearl at the Palms Casino Resort in Las Vegas, NV. Nick Osipczak faces Frank Lester @ The Ultimate Fighter Season 9 Finale from the The Pearl at the Palms Casino Resort in Las Vegas, NV. Melvin “The Young Assassin” Guillard faces ATT fighter Gleison Tibau @ The Ultimate Fighter Season 9 Finale from the The Pearl at the Palms Casino Resort in Las Vegas, NV. Cesar Gracie fighter Nate Diaz from the 209 faces Joe “Daddy” Stevenson @ The Ultimate Fighter Season 9 Finale from the The Pearl at the Palms Casino Resort in Las Vegas, NV. The Ultimate Fighter 9 Finale MMA fight video of Joe Stevenson vs. Nate Diaz. The bout took place on June 20, 2009 at The Pearl at the Palms Casino Resort in Las Vegas. TUF 1 winner Diego “Nightmare” Sanchez faces Clay “The Carpenter” Guida @ The Ultimate Fighter Season 9 Finale from the The Pearl at the Palms Casino Resort in Las Vegas, NV. The Ultimate Fighter 9 Finale MMA fight video of Clay Guida vs. Diego Sanchez. The bout took place on June 20, 2009 at The Pearl at the Palms Casino Resort in Las Vegas. Brad Blackburn fights Edgar Garcia @ The Ultimate Fighter Season 9 Finale from the The Pearl at the Palms Casino Resort in Las Vegas, NV. Mike Ciesnolevicz faces Tomasz Drwal @ The Ultimate Fighter Season 9 Finale from the The Pearl at the Palms Casino Resort in Las Vegas, NV. Kevin Burns fights Chris “Lights Out” Lytle @ The Ultimate Fighter Season 9 Finale from the The Pearl at the Palms Casino Resort in Las Vegas, NV. The Ultimate Fighter 9 Finale MMA fight video of Chris Lytle vs. Kevin Burns. The bout took place on June 20, 2009 at The Pearl at the Palms Casino Resort in Las Vegas. Team UK’s lightweight winner Ross Pearson faces Team USA’s Andre Winner @ The Ultimate Fighter Season 9 Finale from the The Pearl at the Palms Casino Resort in Las Vegas, NV. The Ultimate Fighter 9 Finale MMA fight video of Ross Pearson vs. Andre Winner for the TUF lightweight contract. The bout took place on June 20, 2009 at The Pearl at the Palms Casino Resort in Las Vegas. Team USA welterweight DaMarques Johnson faces Team UK’s James Wilks @ The Ultimate Fighter Season 9 Finale from the The Pearl at the Palms Casino Resort in Las Vegas, NV. The Ultimate Fighter 9 Finale MMA fight video of Damarques Johnson vs. James Wilks for the TUF welterweight contract. The bout took place on June 20, 2009 at The Pearl at the Palms Casino Resort in Las Vegas. IBF and WBO champion Wladimir Klitschko (52-3, 47 KOs) also tries for the Ring Magazine heavyweight title as he goes against Ruslan Chagaev (25-0-1) Saturday before 61,000 fans in Germany. Chute Boxe fighter Evangelista “Cyborg” Santos faces Greg Jackson fighter “Smokin” Joe Villasenor @ Strikeforce Challengers from the ShoWare Center in Kent, Wash.
Nick “The Goat” Thompson fights Tim Kennedy @ Strikeforce Challengers from the ShoWare Center in Kent, Wash.
Former UFC fighter and BJJ blackbelt Jorge Gurgel fights Bully Beatdown and rubber guard specialist Conor “Hurricane” Heun @ Strikeforce Challengers from the ShoWare Center in Kent, Wash. Gurgel guaranteed victory before the match. In my opinion, the fight of the night! Cory Devela fights Luke Rockhold @ Strikeforce Challengers from the ShoWare Center in Kent, Wash.
UFC welterweight Chris Lytle faces Kevin Burns at The Ultimate Fighter 9 Finale. In this FIGHT! exclusive Lytle talks about how losing everything made it possible for him to do anything. Clay Guida "Possible Fight of the Year"
Video Blog: with Andre Winner and Ross Pearson talking about their upcoming finale fight and semi-final wins. Dollar talks about the lack of drama in the house and how the team format stymied the infighting of the past. Fight Nerd Correspondant, Conner Cordova, and his awesome crew put together a video featuring an interview of TUF 9 finalist Demarques Johnson, as well as some highlights of High Desert Rumble from June 13 in Grand Junction, Colorado. Evangelista Cyborg Santos and Joey Villasenor weigh in and get into a shoving match one day before their main event fight at Strikeforce Challengers live on Showtime from ShoWare Center in Kent, Washington. Friday night’s Strikeforce Challengers event, which features a main-event between middleweight Joe Villasenor and Evangelista “Cyborg” Santos, will also take place at the ShoWare Center in Kent, Wash., where today’s weigh-ins took place. The Villasenor vs. Santos main card also includes Tim Kennedy vs. Nick Thompson, Jorge Gurgel vs. Conor Heun and a female bout between Shayna Baszler and undefeated Sarah Kaufman. Diego “Nightmare” Sanchez goes off on Clay Guida. Or did he? It’s tough to tell if Sanchez’s rant is real or not. Watch the little smirk at the end of the interview. This is a big fight for the TUF 1 champ, who may earn himself a title shot with a win. TUF 1 winner Diego “Nightmare” Sanchez trains for his upcoming TUF 9 Finale fight against Clay “The Carpenter” Guida on Saturday. This video features Diego training under Saulo Ribeiro and Apollo Sebastian. It also shows footage of Diego’s training and sparing sessions with fellow Bad Boy Fighters Fabricio “Morango” Camoes and Xande Ribeiro. 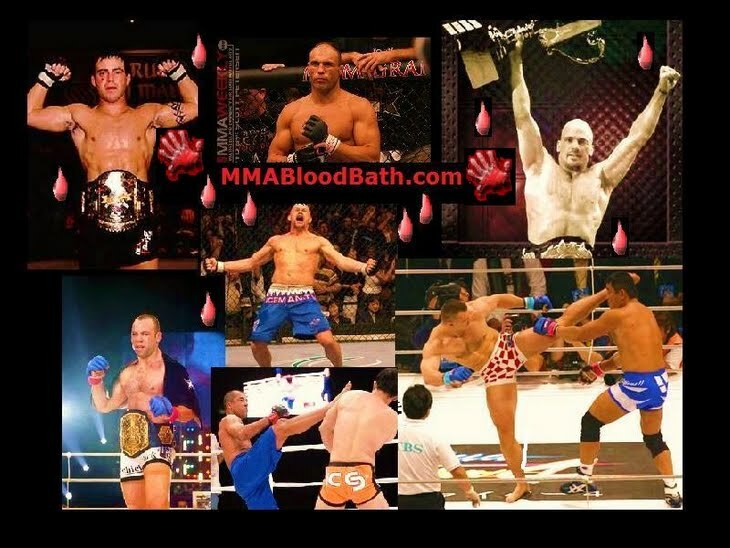 Both Morango and Xande were preparing for their own fights at the time most of the footage was shot. MMA Live is joined by UFC veterans Rich Franklin and Marcus Davis to discuss their bouts from UFC 99. Also newly-crowned Bellator Welterweight Champ Lyman Good comes in to talk about his huge win and a full breakdown of The Ultimate Fighter Finale. For some reason the video takes about 20 seconds to start. The Ultimate Fighter: U.S. vs. U.K. the final episode of the season brings us Team U.S. welterweight Frank Lester against Team U.K.’s James Wilks for the second time. This fight determines who will face DaMarques Johnson in the live finale. John “The Hitman” Hathaway fights Ricky Story in the undercard of UFC 99: The Comeback from the Lanxess Arena in Cologne, Germany. TUF 8 fighter Roli “The Crazy Cuban” Delgado fights Paul “Tellys” Kelly in the undercard of UFC 99: The Comeback from the Lanxess Arena in Cologne, Germany. Paul “Relentless” Taylor faces German wunderkind Peter Sobotta in the undercard of UFC 99: The Comeback from the Lanxess Arena in Cologne, Germany. Video of the Ray Mercer knockout of Tim Sylvia from a different view and the post fight joy of the 48 year old former world champion. Interview: Clay Guida Talks TUF 9 Finale Fight With Diego Sanchez - Video. TUF 9 Finale, Hear the message Guida has for Sanchez. Stefan Struve talks about fighting short guys and having a hatchet chop in the middle of his forehead not bothering him during the fight with Denis Stojnic. Footage taken on June 6th/2009 in Kansas City. UFC 99: The Comeback - MMA fight video of Terry Etim vs. Justin Buchholz. The bout took place on June 13, 2009 at the Lanxess Arena in Cologne (Koln), Germany. UFC 99: The Comeback - MMA fight video of Stefan Struve vs. Denis Stojnic. The bout took place on June 13, 2009 at the Lanxess Arena in Cologne (Koln), Germany. UFC 99: The Comeback - MMA Prelim fight video of Dale Hartt vs. Dennis Siver. The bout took place on June 13, 2009 at the Lanxess Arena in Cologne (Koln), Germany. Dana goes backstage during warm ups with the fighters at UFC 99. It’s great to see him interacting with the fighters. Dana hangs out at the Kölner Dom in old town Cologne and then gets ready for the UFC 99 show. Wayjutsu fighter Caol “Uno Shoten” Uno fights Spencer “The King” Fisher of MFS @ UFC 99: The Comeback from the Lanxess Arena in Cologne, Germany. UFC 99: The Comeback - MMA fight video of Spencer Fisher vs. Caol Uno. The bout took place on June 13, 2009 at the Lanxess Arena in Cologne (Koln), Germany. UFC 99: The Comeback MMA fight video of Rich Franklin vs. Wanderlei Silva. The bout took place on June 13, 2009 at the Lanxess Arena in Cologne (Koln), Germany. UFC 99: The Comeback MMA fight video of Mustapha al Turk vs. Mirko “Cro Cop” Filipovic. The bout took place on June 13, 2009 at the Lanxess Arena in Cologne (Koln), Germany. There’s no love lost between Irish fighter Marcus “The Irish Hand Grenade” Davis and English fighter Dan “The Outlaw Hardy as they fight @ UFC 99: The Comeback from the Lanxess Arena in Cologne, Germany. UFC 99: The Comeback MMA fight video of Dan Hardy vs. Marcus Davis. The bout took place on June 13, 2009 at the Lanxess Arena in Cologne (Koln), Germany. UFC 99: The Comeback - MMA fight video of Ben Saunders vs. Mike Swick. The bout - June 13, 2009 at the Lanxess Arena in Cologne (Koln), Germany. Weigh-ins for UFC 99: The Comeback took place this morning at Lanxess Arena in Cologne, Germany, and all 24 competitors successfully made weight. Preliminary-card heavyweight Denis Stojnic started the first melee when he almost instantly shoved opponent Stefan Struve during the customary staredown photo opportunity. On-stage officials immediately intervened and forced the competitors off the stage. Tapout fighter Donald “Cowboy” Cerrone fights James Krause @ WEC 41 from the Arco Arena in Sacramento, CA. Antonio Banuelos fights Scott Jorgensen @ WEC 41 from the Arco Arena in Sacramento, CA.